I sit here today scrolling through social media as my running friends finish the 41st Marine Corps Marathon and I can’t help but be a little nostalgic for days gone by… I ran the MCM ten times and it holds the honor of being my very first marathon. Yesterday, I shared my ten favorite memories from those ten years, and today I’m hearing of new memories shared by friends. The weather here in the DC area is miserably hot for a marathon and my hat is off to every runner who crosses that finish line. 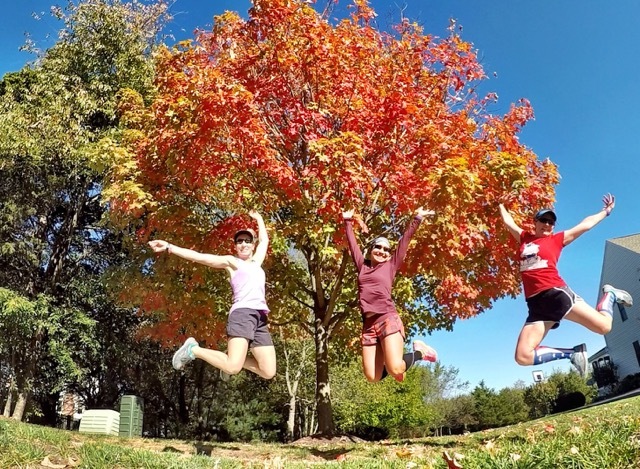 On Tuesday, my friends Erin, Tracy, and I met for a rare mid-morning run and celebrated with a jump shot. I also may have hit the Lululemon website afterward to see if Tracy’s gorgeous plaid shorts are still available. They’re not. 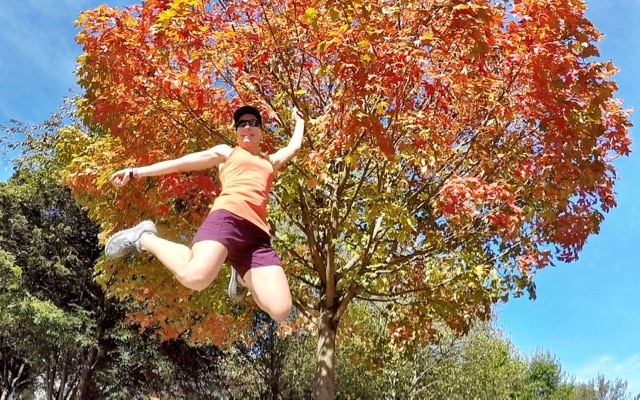 Annoyed that I had on a lavender shirt for my jump photo in front of that gorgeous fall tree on Tuesday, I returned on my next run wearing fall colors. Oh, the things we runners do! Saturday morning I promised my long-time friend Beth that I would join her for a part of her twenty-mile run as she trains for the Philly Marathon. We met at 6 AM and completed ten miles before I handed her off to two more Cruiser friends who were joining her for six miles. I felt so good and it was such a perfect running morning that I continued with them for another mile. After leaving from my friends, I headed back toward the parking lot and along the way I bumped into two other friends, Barb and Lupe, both training for the Richmond Marathon. I ran a bit with each of them and then wrapped up my morning with a few strides over the parkway bridge. Yes, I may complain occasionally that I can no longer run marathons, but let’s face it, I’m a very lucky girl who after so many years of pounding the pavement can still run thirteen easy miles while chatting the entire time and maintaining a 9:45 pace. I am, indeed, grateful for every step. Have you run the Marine Corps Marathon? Do you add planks into your fitness routine? Ten MCMs is impressive!! I’ve never run that one but we’re only 3-4 hours north so it’s definitely on my ‘maybe someday’ list. But I’m also okay with not doing too many more marathons. I prefer the half distance and below. If you do decide to run another marathon, the MCM is definitely one you should consider. It’s amazing and so well done! 10 times! That’s crazy awesome! Wow! What happened that you don’t run marathons anymore? It sounds like you miss it a lot. I have a minor bulge between L4 and L5 and it’s just enough to put pressure on my sciatic nerve if I run too much. I seem to be good up to about 13-15 miles, but anything over that gives me severe nerve pain down my right leg. I haven’t been able to run a marathon since 2011… I keep thinking that I might someday sign up for a marathon, train for a half, run as long as I’m comfortable, and then run/walk the rest. Surprisingly, I’ve been able to run 31+ miles in two Ragnar Relays because the breaks between my runs seem to be enough. Wow did not realize you have done MCM 10 times! That’s pretty impressive. I did the 10K today a distance that used to be easy but lately feels hard. 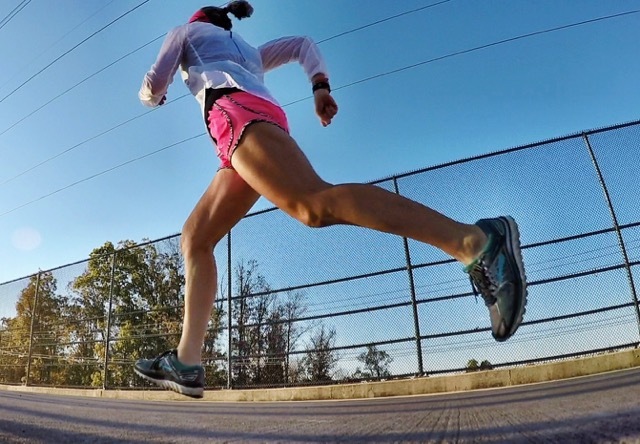 I am also grateful for all that running gives me even if it’s not always enough. I hope you had a great time at the 10K. How many years have they been holding that race? I don’t think it existed when I ran the MCM, but I could be wrong. Thanks, Kim! I hope the MCM dream comes true for you. Didn’t race this weekend, I am running NYC next Sunday. So I am in the middle of taper and loving it. I love your jump photos, I am never successful in getting one and after trying several times my knees complain. So I have stopped trying, LOL. 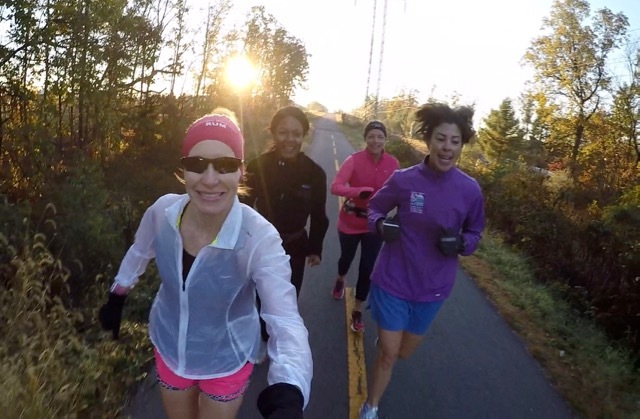 Sounds like you had a great week and you are lucky to have so many running friends to run with. Try shooting your jump shots in video mode and then capturing your favorite frame so you only have to jump once. I’ve always done this on my GoPro, but just discovered I can do the same on my iPhone! Give it a try and tell me how it works! Moat impressive Deb! Just to be able to run one marathon would be a dream come true for me. But we all have to accept the limitations our bodies put on us and mune will just not allow it. Like you though, I am grateful for the any halfs I’ve done and thankful to still be able to run! Cute jump shots! I ran MCM a few years ago and it was one of my favorites. It was perfect running weather the year I ran it. I do feel bad for those who ran it this year during those high temps. I was happy to only have a 10k on my schedule this past weekend. Great job with all those workouts! Being able to support a friend training for a race is an awesome feeling. I bet Beth really appreciated it! I’m also running the Philly marathon and did my 20 miles this weekend…what a wild ride! My son’s girlfriend is also running Philly. I hope all of you have great races! Good luck! MCM is on my bucket list. I was supposed to run it as a relay in 1995 when I was stationed in D.C. but had to pull out due to a specialty school I had to attend. I hope you’re able to make it back to run MCM one day. You’ll love everything about this race! How wonderful you were able to run 10 MCMs. That’s truly amazing. I realize my time is probably limited with the marathon distance. I hope I’m healthy enough to complete a few more in the coming years. I go in spurts with planking. They seem to hurt my back. Right now I’m not planking. Thanks for linking, Deb! Beautiful tree and jumping pics too! Instead of pushing to do a longer plank, try breaking it up into shorter segments and see if that helps as you build up your strength. Also, make sure you’re not swaying your back. Focus on contracting your abs, quads, and glutes while holding your plank – think of pulling everything tight against a skewer running the length of your body. You’ve run the MCM ten times? Wow!! I’ve run it once in 2007 when the Chicago Marathon was cancelled. But it was unofficially. And i just realized that all of this time I’ve told everyone that I’ve run 8 marathons when in reality it has been 9. That Chicago Marathon totally counts! My friend Beth ran Chicago that year, too, and luckily she was far enough along that they let her finish. 10 times?? That is awesome! In thinking about my 2nd marathon I can not get this one out of my mind! I’m not ready to take the plunge just yet but I really can’t seem to get it out of my mind! Thanks for this and for joining us! If you have the opportunity to run the MCM some day, it won’t disappoint! You are too funny… I’ve had those plaid shorts for a few years now and always wondered if they look like men’s boxers when I wear them! 😉 Looking forward to more runs in the DAYLIGHT!